How do I switch from Pinterest to Instagram account in the dashboard? 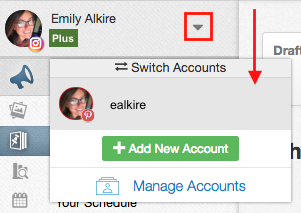 Here's how to switch between multiple accounts, in case you can't see the Pinterest side or Instagram side and want to. You can manage many different accounts under a single Tailwind dashboard. If you can't see one of these accounts, you might just need to switch the viewing account.